Sam Brannan arrived in Napa Valley in the late 1850s with the dream of making it the 'Saratoga of California.' In 1866 cottages were built and palm trees planted in preparation for the grand opening of the resort. This is the only cottage still standing. From the California Office of Historical Preservation. 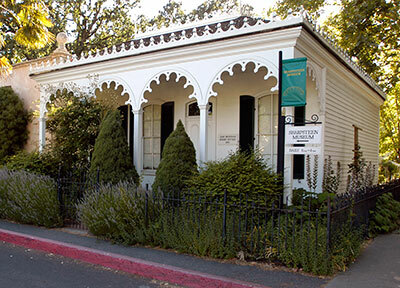 We were unable to locate a commemorative California Bear Flag plaque, but the cottage is open to the public as part of the Sharpsteen Museum of Calistoga History.